With the price of ethanol hovering at U.S.$2.00 per gallon at the beginning of the year, and taking into consideration that nations such as Canada, China, India, Sweden, and Japan are gradually increasing ethanol consumption, ethanol production presents an enticing opportunity for the cash strapped, sugarcane nation of Cuba (Johnson, 2008). However, whereas Cuba devoted 1.4 million hectares of land to the production of 75 million metric tons (MT) of sugarcane in 1989,2 in 2007, the land under sugar cane cultivation was no more than 400,000 hectares and sugarcane production was less than 12 million MT (CEPALSTAT, 2009). If Cuba were to restore sugarcane production to its pre-1990 levels, Cuba could manufacture an annual supply of 1.5 billion gallons of ethanol, earn over U.S. $3 billion,3 and become the third largest exporter of ethanol in the world (see Table 1). But for Cuba to produce ethanol at an international scale it must acquire the needed technology—at the moment the few Cuban distilleries that could potentially be converted into ethanol factories are small and their capacity is limited to a trivial volume of 84 million gallons a year.4 Given that the Cuban regime does not have the capital to finance the development of the ethanol sector, capital will have to be injected from the outside and as investor asses their risks they will evaluate the backward and forward linkages of the Cuban sugarcane sector as well as trends in the world demand for ethanol. The intention of this work is to assess whether Cuba can become an important ethanol producer. With this in mind, the first section will examine the conditions for why Cuba might potentially become an important ethanol producer. The second section will provide an in depth description on the evolution of the Cuban sugarcane sector. And the third section will appraise the present and future world demand for ethanol. This section sets out to provide a brief explanation on the conditions that favor ethanol production in Cuba. The emphasis of this section will be on Cuba’s ability to grow and transport sugarcane. According to Agronomic Engineer, Guilherme Rossi Machado Jr., the growth of sugarcane is contingent on four basic requirements: soil, temperature, rain fall, and latitude (Machado 210). This sub-section will briefly analyze how each requirement applies to Cuba. Soil: Sustainable sugarcane production takes place in soils that are well-drained. With this in mind, since 1997 the Cuban government has concentrated sugarcane production around the provinces of Matanzas, La Habana, Villa Clara, and Cienfuegos. The red soil in these provinces is considered to have excellent drainage and acceptable fertility (see Figure 1). Temperature: Temperatures ranging between 16°C and 38°C are the most suitable for sugarcane cultivation. Furthermore, sucrose accumulation levels are higher where the difference in temperature between day and night is high—ideally 10°C (Machado 210). Cuba fits both prerequisites impeccably. Not only is the average temperature 26°C, but the average temperature difference between day and night is 10°C (Cubaweather.org, 2009). Humidity: It is estimated that 70 percent relative humidity is the perfect level for sugarcane cultivation, yet lower humidity levels during the dry season are believed to assist the ripening process (Machado 211). Cuba meets both conditions. The relative humidity level of the island during the wet season is 75 percent and 60 percent during the dry season (Machado 211). Latitude: Sugarcane produces its highest content of sucrose at latitudes 18° North and 18° South. The island of Cuba lies just above this mark, between 19° and 23 ° N (Machado 211). It has been shown above that Cuba possesses the ideal land and climate for the production of sugarcane. These conditions are complemented by Cuba’s readily available and highly experienced labor force. Estimates suggest that before the area under sugarcane cultivation was downsized there were 460,000 workers directly employed by the sugar agroindustry sector (Pérez-López 298). The vast majority of these workers were unprofessional laborers that could be easily shifted back to the harvesting of sugarcane for ethanol factories. But, it is also important to point out that Cuba also possesses many highly skilled workers and researchers that could run and oversee Cuba’s prospective ethanol sector. The fact that sugarcane has historically been the island’s main crop significantly favors ethanol production in Cuba. Cuba’s prospective ethanol sector would also benefit greatly from Cuba’s expanding infrastructural projects. Between 1990 and 2001 alone, the Cuban government expanded the island’s highway network from 245,000 kilometers to 609,000 kilometers (ECLACSTAT, 2009). Figure 2 presents the growing highway network, yet, it is important to point out that there are smaller roads not seen in this map that branch out of the highway and into the sugarcane fields. Figure 2 indicates that the major sugarcane producing provinces—La Habana, Matanzas, Cienfuegos, and Villa Clara—where ethanol factories are more likely to be built, are all integrated by Cuba’s modern highway system. Furthermore, the four provinces are in close proximity to the two most important ports in Cuba, Ciudad La Habana and Cienfuegos, both of which have received millions of dollars of foreign investment to increase their depths and to improve their infrastructure (Cuba Transition Project, 2009: Havana Journal, 2008). In 2008 alone, the port of La Habana received a US $250 million investment from the United Arab Emirates (Institute for Cuban and Cuban American Studies 1). Given that Cuba’s prospective ethanol sector will be competing with other developing nations such as Mozambique, Ethiopia, and the Philippines, having a strong foundation from which to build will favor ethanol production in Cuba. Cuba will also have an advantage given its specialization in sugarcane-based ethanol. Among ethanol production methods, the production of sugarcane-based ethanol is the most cost efficient. Ethanol blends made from starches such as potatoes, corn, wheat, or barley are more expensive to produce because before their starch content can be distilled it must first pass through three extra steps. The three steps that must be carried out before starches can be distilled bring about significant costs for starch-based ethanol producers. Additional costs are incurred by starch-based ethanol producers due to the high water requirements in the refining process of starches into simple sugars. Although water has yet to be valued as highly as energy, excessive water usage is yet another unnecessary cost evaded by sugarcane based ethanol producers. In Minnesota, for example, it is estimated that during 2005, corn bio-refineries consumed an average of 4.2 gallons of water for every gallon of ethanol produced (Goettemoeller and Goettemoeller 118). Furthermore, sugarcane-based ethanol benefits greatly from its ability to use leftover bagasse to produce heat and energy. When sugarcane bagasse is burnt, the heat can be used to power the ethanol factories, reducing energy costs. Since only 20 percent of the bagasse is estimated to be needed to power each factory, the rest can be sold onto the electric grid (Goettemoeller and Goettemoeller 149). In today’s competitive world, small cuts in the cost of production will determine which ethanol blends compete in the international market. The recent bankruptcy of VeraSun Energy, a starch based ethanol producer and the second largest ethanol producer in the United States, reflects the difficulty that starch based ethanol producers have to manufacture ethanol at a competitive price. Today’s low sugarcane yields should not discourage the development of Cuba’s prospective ethanol sector; instead, it is important that investors embrace long time horizons. Cuba possess the ideal conditions for sugarcane cultivation—with time and good harvesting practices, production yields should increase to a competitive level. This expected rise in production is what will make Cuban ethanol an enticing business; and Cuba’s modern transportation networks and highly experienced labor force will complement this process. Based on the last chapter there is reason to believe that with adequate investment and access to markets Cuba could become an important world supplier of ethanol. However, whereas Cuba was one of the four largest sugarcane growers in the world in the 1980s, today, the island has downsized its sugarcane farms by more than half and the annual harvest is only an eighth of the average of the 1980’s (CEPAL-STAT, 2009). Given that Cuba’s prospective ethanol industry will only be successful if it can receive stable supplies of high-quality sugarcane; this chapter will examine the evolution of the Cuban sugarcane sector post-1970, and determine what factors contributed to its recent downturn. Drawing attention to the sectors ability to supply sugarcane will facilitate the assessment of Cuba’s prospective role as an ethanol producer. In the 1970s in the face of enticing Soviet sugar premiums Cuba turned its economy upside down in pursuit of sugar-oriented policies (Table 2). In order to take full advantage of this new environment it became extremely important for Cuba to mechanize its industry. Mechanization had been attempted in 1961, but had been quickly abandoned two years later because its efficient operation required costly changes in field layout and cane transportation (Pollitt and Hagelberg 8). Yet, in the 1970s conditions were different. With Soviet sugar premiums hovering around 36 cents/ pound—a price far above the average world price of 8 cents/pound—Cuba’s mechanization program was a lot more feasible than in 1961. Between 1970 and 1980, Cuba purchased 28,000 new tractors—a 32 percent increase from the previews decade—and by 1979 Cuban mills were processing over 73 million tons of sugarcane, twenty million tons more than the average of the 1960s5 (Alvarez and Castellanos 16). By the end of 1970s, Cuba had become the world’s leading sugar exporter, and one of the world’s top four sugarcane producers (Echevarría 2002, 104). The Cuban sugarcane economy was experiencing developmental conditions unlike those of any other sugarcane producing nation in the world. However, because labor productivity was low,6 and the size of the labor force was in decline, the success of the Cuban sugarcane sector was contingent on the mechanization of its industry and on the purchase of costly imports. The expansion of its sugarcane fields was extremely costly and inefficient; yet, the costs were nonetheless tolerated because they were financed by Soviet sugar premiums. When Mikhail Gorbachev launched perestroika and glasnost in 1985—a set of liberal reforms that intended to stimulate the Russian economy and which curtailed trade and aid to Cuba—the impulsive expansion and modernization of the Cuban sugarcane fields came to a gradual halt. Given that the extensive expansion of Cuban sugarcane cultivation had only been possible with high levels of capital investment and costly imported inputs, without Soviet financial assistance, sustaining the production levels of the 1970s became quite difficult. Between 1981 and 1990, agricultural yields decreased at a yearly average of .243 Mt/ha (Alvarez and Peña Castellanos 12). In a desperate move to sustain sugarcane production levels at 75 million MT, the Cuban regime increased its participation in the sugarcane sector. The regime eliminated private farms; it reinstated massive labor mobilization; and promoted moral incentives (Mesa- Lago 2004, 35). However, without material incentives, the regime was unable to encourage its sugarcane workers to be more productive, and as the machinery and equipment for the sugarcane fields broke down and basic inputs became scarce, sugarcane yields plummeted further7 (Table 3). In the complete absence of Soviet financial support, the Cuban regime lacked the capital to obtain the required replacements, and whereas in 1989 over one million hectares had been fertilized with N-P-K (nitrogen, phosphorous, and potassium) fertilizer, by 1992 the regime could only afford enough N-P-K to fertilize 27,000 hectares (Alvarez and Peña Castellanos 44). As the Cuban regime became ever more desperate for necessary imports, it instructed in 1993 for all sugarcane available to be harvested. Cuban agronomists had suggested that at least twenty-five percent of the harvest had to be retained to prevent the deterioration of the fields. Yet, the government was in need of revenues and also pressured to honor its trade agreements.8 As result, it decided to harvest as much sugarcane as possible (Pollitt 2004, 76). By 1994, overambitious harvesting left many fields underpopulated and without the necessary inputs their output declined (Alvarez and Peña Castellanos 3). Poor harvesting techniques had exhausted Cuba’s sugarcane fields, and by 1994 production yields were 42 percent lower than those experienced in 1958 (Echevarría 2002, 104). In the past, whenever Cuba had had to offset low agricultural yields, it had simply injected costly inputs into the sugarcane fields. By 1995, that was no longer an option. The Cuban regime had to instead rely on techniques that encouraged efficiency (Mesa-Lago 2004, 37). In 1997, in the face of low sugarcane yields, a new minister was assigned to the Sugar Industry (MINAZ). Under the new leadership of Gen. Ulises Rosales del Toro, MINAZ set out to reestablish good harvesting practices and to reduce the production costs associated with the cultivation of sugarcane. To achieve its objectives, MINAZ prohibited the harvest of immature sugarcane, instituted a year-on-year sowing program, and returned the industry to a ninety to one-hundred-day harvest. MINAZ also decided to downsize the area under sugarcane cultivation. By downsizing the area of land under sugarcane cultivation from 1.2 million hectares to 750,000 hectares, MINAZ intended to allocate limited key inputs among the most productive plots of land (Pollitt 2004, 99) (Table 4). Under this new environment sugarcane yields quickly improved. Between 1995 and 2000, per hectare sugarcane yields increased from a low of 28 MT to 35 MT (CEPAL-STAT, 2009). 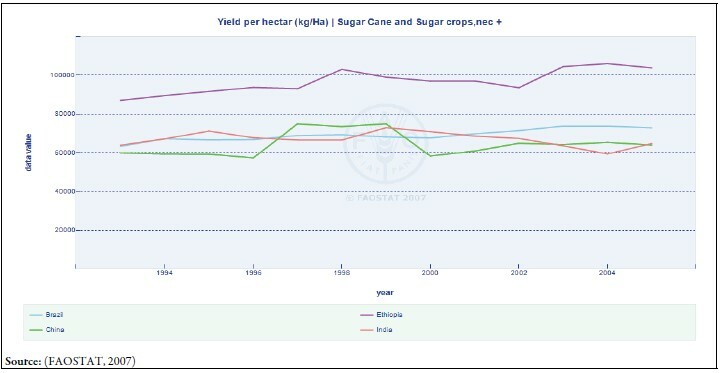 Per hectare yield might not have been as high as they had been in the 1980’s, however, the sugarcane was cleaner and the percent of sugar extracted from each ton was 20 percent higher.9 But, in 2005, as the policies implemented by MINAZ began to show their first results, Cuba got hit by the worst hurricane season in forty years (National Hurricane Center, 2006). Sugarcane yields dropped to 22 Mt/ha and millions of dollars worth of equipment were lost (CEPAL-STAT, 2009). The sugarcane fields were devastated, and as shown by Table 5, sugarcane production continues to struggle to recuperate. Given that sugarcane cultivation had grown far above its means, when Soviet subsides were terminated in the early 1990s, MINAZ had no other option but to downsize the area under sugarcane cultivation. This reality should not be interpreted to mean that a prospective ethanol sector on the island has no future. Although, it does suggest that it is very unlikely that Cuba will ever grow enough sugarcane to be the largest ethanol producer in the world, Cuba can still become an important ethanol-supplier. Thanks to climatic conditions described earlier, if Cuba truly commits itself to the practice of stable harvesting techniques, each hectare of Cuban land is believed to have the capacity to produce 70 MT of sugarcane (Sánchez 191). Yields of this magnitude would rank Cuba among the most productive sugarcane producers in the world. Assuming that Cuba does not increase the original area under sugarcane cultivation from 400,000 hectares, if Cuba were able to attain the production capacity given above, it would still be able to annually produce 28 million MT of sugarcane. If directed into the production of ethanol, this amount of sugarcane would produce 616 million gallons of ethanol and generate over US$1 billion. ETHANOL AND THE WORLD MARKET FOR ENERGY: WILL A MARKET EXIST FOR CUBAN ETHANOL? Given that Cuba’s daily energy consumption is fairly low,10 Cuba could export its potential 616 million gallons of ethanol to generate needed reserves. As global energy demand rises,11 as the security of fossil fuels becomes uncertain, and as global climate issues reach the forefront of policymaking, it will become increasingly more important to combine fuels and technology to satisfy our energy needs. It will take some time before ethanol can be gradually adopted as an important source of renewable energy, yet on the medium term, given that Methyl Tertiary Butyl Ether (MTBE) has been banned in the United States, Canada, Europe, and Japan, the prospective Cuban ethanol sector could profit significantly from the world demand for octane enhancers12 (Goettemoeller and Goettemoeller 18). This section sets out to appraise the present and future world demand of ethanol. In the early 1990s ethanol was reintroduced as an oxygenate to be added to gasoline to reduce carbon monoxide emissions. However, it was not until MTBE began to be banned worldwide in the late 1990s that ethanol began to truly participate in the oxygenates market. Ethanol producers have benefited greatly from ethanol’s adoption as an oxygenate, yet the future of ethanol lies not on as an oxygenate, but on the end of cheap and easily accessible oil. The European Union, for example, expects to double its ethanol consumption by the year 2020; Cuba could take advantage of this increase by using the EU’s Generalized System of Preferences in its trade exchanges with the EU. The Chinese government has also decided that it will import and produce more renewable sources of energy and to achieve this objective a recent law was approved that requires all fuel-traders to add at least 10 percent ethanol in the fuel mix. Given that China’s corn-based-ethanol is highly expensive—at U.S. $1.7/gallon—it is possible that the Chinese government will favor the importation of the fuel. In that case, Cuba could capitalize on China’s growing energy demand which is expected to grow from 69 quadrillion BTUs to 145 quadrillion BTUs by 2030 (Klare 73). In 2005, the United States announced that in the next ten years it will substitute 20 percent of its petroleum fuel consumption with ethanol. In order to attain this objective, ethanol imports are expected to grow by 2017 from their original level of 713 million gallons to 3.9 billion gallons. If relations between the United States and Cuba normalize, considering Cuba’s proximity to the United States, Cuba will have a significant advantage in delivering ethanol to the United Sate. Because of the size of its ethanol market and its proximity to Cuba, the United States will play a considerable role in the development of Cuba’s prospective ethanol industry. Possible tax exemptions could particularly give Cuba a huge advantage against the better established Brazilian ethanol industries, shipping their product from more than 6,000 kilometers away. The governments of Japan, Canada, India, the Philippines, and Thailand have also expressed similar intentions as those proposed by the aforementioned nations and as Figure 4 demonstrates, when these measures take place, demand for ethanol is expected to increase exponentially. As world energy demand increases, ethanol will not be the solution to our energy needs; nor will the solution be coal, natural gas, oil, hydropower, solar, wind, or nuclear energy: ethanol will become one of the many indispensable sources that will constitute the energy basket of the future. With this in mind, nations across the world are no longer blending ethanol in gasoline as a simple oxygenate, but also using it to diversify their energy needs and reduce their dependence on oil. Wanting to tend to this trend, auto manufacturers are increasing the number of flex-fuel vehicles capable of running on E85—85 percent ethanol—and in the United States alone, between 2005 and 2007 the number of E85 flex-fuel vehicles on the road increased by 1 million (Goettemoeller and Goettemoeller 56; National Ethanol Vehicle Coalition). The niche for Cuba’s prospective ethanol sector will emerge out of this growing demand for energy. This work demonstrated that Cuba has the potential to become an important ethanol producer. Not only does the island enjoy of the appropriate conditions for sugarcane cultivation, but a prospective ethanol sector will also benefit from an experienced and readily available labor force and a developing transportation network. Also, although the productivity of Cuban sugarcane fields was severely disrupted after the 2005 hurricane season, field productivity is expected to significantly improve to an internationally competitive level thanks to better harvesting techniques and to the recent adoption of rice-sugarcane rotation. As the world increases its demand for low-priced ethanol, Cuba’s low field production costs and the cost efficiency associated with sugarcane based ethanol will further favor the development of a Cuban ethanol sector. If Cuba becomes an important ethanol supplier, its location will place it in a particularly advantageous position given that Cuba lies closer to the United States and to Europe than most of its future competitors. Cuba already has preferential access to the ethanolthirsty European market and there is a realistic possibility that before too long the United States will normalizes its trade relations with the Caribbean island. Everything indicates that Cuba can become an important ethanol producer, now it is necessary that the knowledge of science, engineering, finance, and marketing are brought together to support the development of Cuba’s prospective ethanol sector. 2. Calculated by author (based on Pollitt, 1981 4). If sugar produced was 8,121,000 tones and industrial yield was 10.83, sugarcane production had to be 74,986,000 metric tons. 3. Calculated by author (ECLAC-STATS, Sánchez). Out of each ton of sugarcane, 22 gallons of ethanol can be produced. 74 m MT of sugarcane X 22 gallons = 1,628,000,000 gallons of ethanol, at a price of U.S $2 per gallon = U.S.$3.2 billion. 4. Cuba’s production calculated by the author from Alvarez and Peña Castellanos, 112. 5. Calculated by author from Echevarría 1995, 370. 6. The sugarcane workforce no longer had an incentive to maximize its income by harvesting more sugarcane during the peak period of the harvest because the 1959 Agrarian Reform had frozen wages and guaranteed all workers year-long employment. 7. In 1989 sugarcane yields were 60 MT/ha; by 1992 they had fallen to 36 MT/ha. 8. By 1994 Cuba failed to deliver 500,000 tons of sugar to China (Mesa-Lago 313). 11. Energy demand is projected to grow by the year 2030 from its current level of 465 quadrillion BTUs to 702 quadrillion BTUs (Klare 246). 12. Octane enhancers are added to reduce carbon monoxide emissions and improve engine performance. 13. Parts that come in contact with the ethanol have to only be replaced with compatible replacements capable of withstanding the corrosive properties of ethanol.